I don't know how I'm doing it, but every time I go to Berlin I'm looking for symbols. Last year I went on a summer school which took me from Warsaw to Krakow to Berlin and Trier so I've started in Poland looking for symbols and signs and continued throughout the journey. That was sort of my goal for the trip. This year I was walking Luna on the Unter den Linden boulevard and spotted a very trendy store build around the Ampelmann. I was intrigued and I wanted to find out more. They even let me inside with Luna and told me the story of the Traffic Light Men. Turns out that this Traffic Light Men was designed by Karl Peglau and placed on the intersections of the roads in East Germany towns in 1969. It represented a men with a hat crossing the street for the green light and standing for the red. After the fall of the wall in 1989 the Ampelmann was meant to be replaced. But Markus Heckhausen saw the potential of this funny figurine and turned a couple of them into lamps for home use. Little by little they were again introduced as traffic lights due to their gaining popularity, in 2005. Today every German land has the freedom to adopt it's own traffic lights design, but a lot of them adopted the Ampelmann. The Ampelmann is present on Berlin's streets and closer to me in Saarbrucken and in 2007 LET lights were placed behind the figurine for better visibility and cost control. In Berlin the home lamps producing company founded by Heckhausen has 8 shops where they are selling over 600 products based around the green figurine of the Ampelmann. Of course I bought some earrings which I wore in Berlin and I will wear them again on certain occasions. 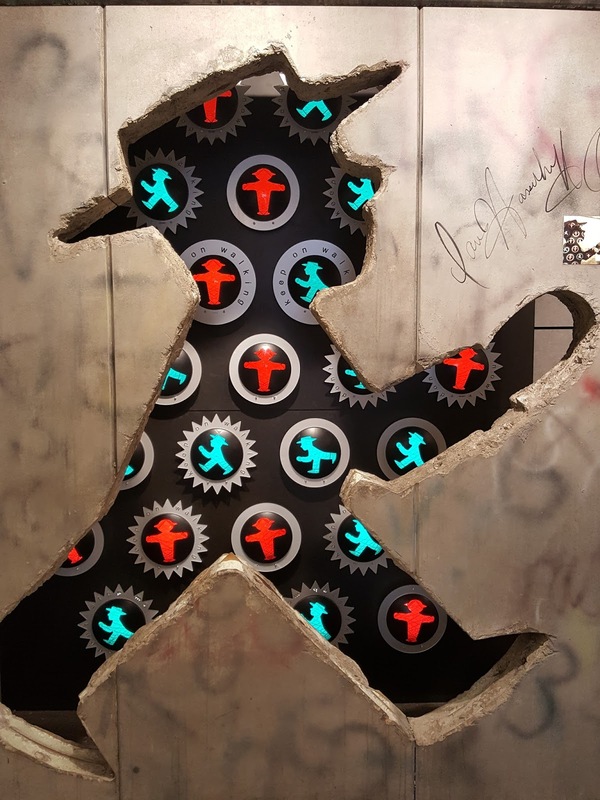 I know that reading the title you were maybe thinking that I will write about the Bear of Berlin in a country which to my knowledge doesn't have bears, but for me at this time in my life the Ampelmann has more meaning. I'm not a nostalgic of the time when the symbol was created, by the contrary I wish that time was erased from the history and our memories and I wish it would not influence us still, but one has to recognise the importance of symbols. I see the Ampelmann as a positive symbol of a country very much affected by history. So if you find yourself in Berlin looking for a souvenir, go to one of their stores.